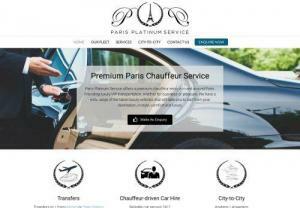 Paris Platinum Service is a private and prestigious limousine service, providing each client with a v.i.p chauffeur-driven journey, luxury shopping experience, business and roadshow transportation. Available for all your travel needs in and around Paris, France. Whether here for business or pleasure, our experienced chauffeurs provide each client with special care and attention and no request is too big or too small.